Copenhagen, Denmark, 2017-May-23 — /Travel PR News/ — With spring very much in the air and summer on the way, parents everywhere will be gearing themselves up to face that perennial challenge – how to keep the kids happy on the next family break. Those looking for inspiration should follow the example set by an ever-increasing number of British families and head to Legoland Billund Resort in Denmark, where an appealing mix of awesome attractions, breath-taking beaches and engaging activities provide the perfect recipe for a family break that everybody will enjoy. A family holiday in Denmark is a very cost-effective option, especially if travelling with British Airways and taking advantage of this year’s special offer where KIDS GO FREE on flights between Heathrow and Billund from 1 June to 31 October 2017. As the only BA destination outside the UK where two children fly free with one adult, the Legoland Billund Resort is an ideal destination for a fun and affordable family break. The launch of the first British Airways flight from Heathrow to Billund at the start of May last year has opened new opportunities for all the family to explore a treasure trove of history, landscapes, beautiful towns and stunning coastline in Southern Denmark. With no less than 3 UNESCO sights, this area is renowned for its wonderful natural diversity as well as its extensive array of family friendly attractions, including the original Legoland, making it a pristine playground for young and old alike. Legoland Billund Resort consists of fun family adventures such as the world’s first LEGOLAND®, the massive waterpark in Lalandia® and exotic animals in GIVSKUD ZOO®. From coast to coast in mainland Jutland, you can rest assure that your family will not come short of things to do. LEGOLAND Billund Resort is easily accessible, with Billund Airport situated right in the heart of the area. Things are set to get wilder than wild for visitors to LEGOLAND® following the opening of its new attraction, LEGOLAND NINJAGO World. The 5,100 m2 complex, built from no fewer than 1.5 tonnes of LEGO® bricks, is full of entertaining challenges. Using the latest technology, the 4D experience puts all the family’s ninja skills to the test as they battle the mighty serpent and arch enemy, the Great Devourer with a series of entertaining challenges. Testing agility in Lloyd’s Laser Maze, strength on Cole’s Climbing Wall and speed on Jay’s Rapid Response Training as well as the 4D thrill of LEGO NINJAGO The Ride. Northern Europe’s largest water park, Lalandia, located next to LEGOLAND has added to its aquatic adventures with the launch of Wild River, Europe’s longest outdoor water slide. Covering a distance of 167 metres, with speed and thrills guaranteed on every slide down, the new attraction has an outdoor pool, which, like the water slide, is heated and open all year round. The new slide starts and ends inside the tropical Aquadome in Lalandia, where visitors can also enjoy indoor fun whizzing down water slides, riding the surf in the wave pool or savouring life in one of the hot Jacuzzis. There is also the chance to dive down to the Cave Pool where they’ll see colourful tropical fish swimming past in a huge underwater aquarium only a few centimetres away. For animal loving families, situated 22 kilometres from LEGOLAND and Lalandia in Billund, GIVSKUD ZOO is a wildlife safari park where visitors can drive among lions and monkeys and see rhinoceroses, gnus, gemsboks, black horse antelopes and African buffalo roam free in large enclosures. Coinciding with the 85th birthday of the first wooden block and 60th birthday of LEGO’s all important interlocking brick, LEGOLAND Billund will open a new sleek LEGO House in 2017. The new 12,000 m2 building has been designed by the Bjarke Ingels architect group to look like a cloud of interlocking LEGO bricks with a pile forming the roof of a new covered square leading to interconnected terraces and playgrounds. Inside, LEGO House will be a hands-on minds-on experience where LEGO fans of all ages can come and experiment with LEGO bricks, share stories with LEGO bricks, express their imagination and creativity through LEGO bricks whilst meeting other LEGO builders from all over the world. 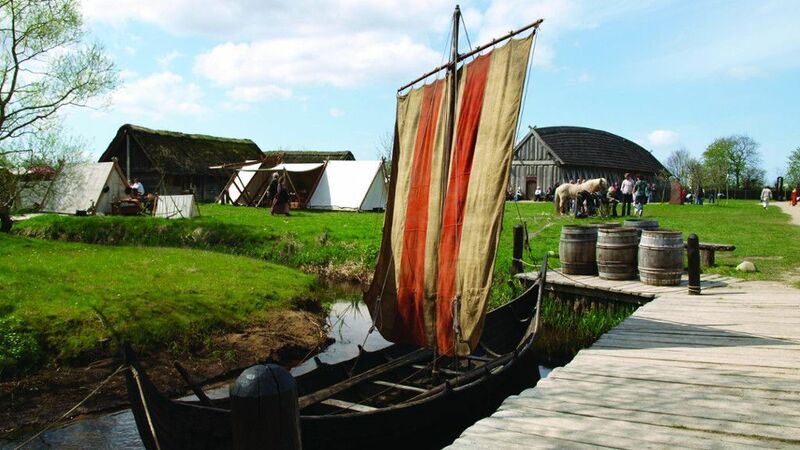 Stepping back to the time of the Vikings, families can see Viking history come to life at Denmark’s oldest town, Ribe on the west Jutland coast. Offering a fascinating re-enactment of the Viking’s way of life, at the Ribe Viking Centre visitors can grind flour using ancient techniques and bake flat bread over the flames in true Viking style. On a visit to the royal mint they can make their own copy of the coins in use in the eighth century at the marketplace by the Ribe Å river. The Viking trail leads on to the UNESCO World Heritage site at Jelling, where the Viking king Gorm the Old and Harald Bluetooth erected two famous rune stones, built the largest Viking structures of the period and converted the Danes to Christianity. As a living memorial, the town features the recently opened Royal Jelling Experience Centre – where visitors can embark on an interactive journey back in time. On the coast of South-West Jutland, the Germans started building the Tirpitz Bunker as a part of the Atlantic Wall in 1944 but never finished it. In 2017, the Danish architect group, Bjarke Ingels Group, will complete work on an impressive new hidden away, state-of-the-art, glass and grass roofed museum in the coastal dunes that will run alongside the WWII bunker. Helping to bring the former historic building to life, the museum will comprise four separate exhibition spaces featuring the Atlantic Wall, life on the Danish West Coast, the World’s largest collection of amber and a visiting exhibitions area. On the West Jutland coast the Wadden Sea National Park, which received UNESCO World Heritage status in 2014, is one of Denmark’s most ecologically important areas as a home to birds, seals and native oysters. At low tide up to 700 seals fill the sandbanks on Sønderho beach on the island of Fanø and can be observed from the deck of a harbour cruise. Guided tours such as forage excursions for fresh oysters and to see the ‘Black Sun’ can also be arranged. Near to Jelling the historic town of Christiansfeld is another recent addition to the UNESCO World Heritage listing. This pretty little town, which was constructed between 1773 – 1800 is dominated by an impressive Moravian Church and is famed for its ‘honningkager’ or honey cakes, which we know as gingerbread. It’s still possible to visit the bakery of the Moravian Brethren and see the famous gingerbread hearts being made. Feel the thrill of swinging on 2km of tree top high ropes on six different courses with varying degrees of difficulty. Gorilla Park Vejle offers more than 100 great elements at heights from 1-21 metres including zip lines, Tarzan swings, base jumps, climbing walls, BMX and snowboard. The new Gorilla Big Swing is a pure adrenalin rush. Participants get the feeling of free falling from a height of 15 metres, before sliding into the swing and then a split second of weightlessness just as the return swing begins. For adventurous families the old Little Belt bridge, which connects the region of Jutland to is easterly neighbour, the island of Funen, a new bridge walking experience opened last year. Until recently, bridge walking was an activity restricted to Sydney, Australia or Auckland, New Zealand. All that changed in May 2015 when Mary, Crown Princess of Denmark, herself a native of Tasmania, inaugurated Europe’s only superstructure built on top of an old bridge. Starting at the Welcome Centre in Middlefart and dressed in special overalls, visitors in groups of 20 meet their guide before stepping out on the footbridge to climb the stairs of the turret attached to a safety system. During the two-hour tour the guide will recount the story of the 1,125-metre-long bridge that connects Jutland to Funen and participants will be able to observe from 60 metres about sea level the architecture, construction and scenic countryside of the Little Belt whilst watching traffic passing beneath. Tickets cost 269 DKK (£28) per adult and children under 16 (over 140cm tall) 190 DKK (£20). Another of the region’s key attractions is the TRAPHOLT museum of art and design in Kolding. In addition to its permanent collections of modern artworks and 20th Century Danish furniture, the museum has a sculpture park with works by Danish contemporary artists and also stages revolving exhibitions of art, design and handicrafts. Other highlights include the summer cottage belonging to Arne Jacobsen (the legendary designer best known for his iconic ‘Egg’ chairs), which can be visited on a guided tour; and a museum shop stocked with designer gifts and homewares. This entry was posted in Attractions, Business, Holidays, Recreation, Tourism, Travel, Travel & Kids, Travel Management, Travelers and tagged Billund, British Airways, flights, Heathrow, KIDS GO FREE, VisitDenmark. Bookmark the permalink.